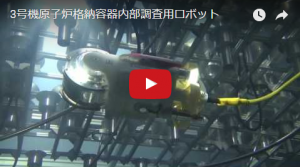 As part of the decommissioning activities for the Fukushima Daiichi Nuclear Power Station, operated by Tokyo Electric Power Co., (TEPCO), a small submersible crawling robot was developed to investigate the internal surroundings of the pedestal, under the Reactor Pressure Vessel (RPV), in the PCV of Unit 3, where coolant water had accumulated. The robot was released to the media on June 15, 2017. The small robot, which is approximately 13 cm and 27 cm in diameter and length, respectively, is equipped with cameras and LED lights on both its front and rear. It has four screws on its rear and one on its upper body, and can be remotely controlled via a wire cable. An investigation on October 20, 2015 revealed that six meters of coolant water had accumulated in the PCV of Unit 3, where the investigation took place. 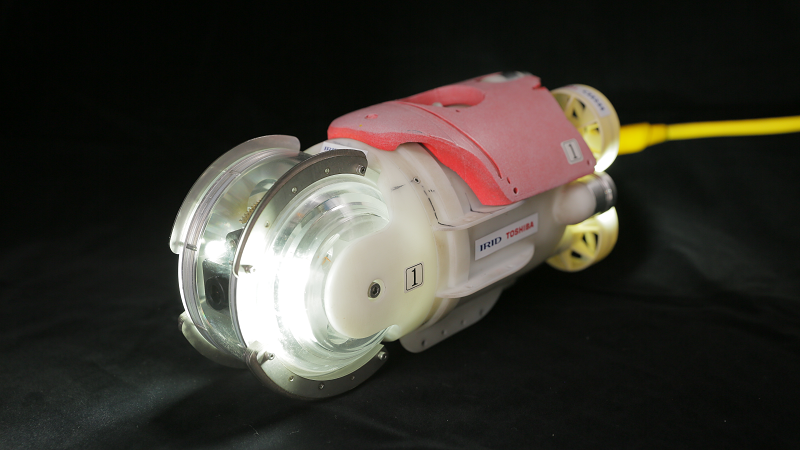 For this investigation, IRID required a robot that could swim and investigate underwater, in order to evaluate conditions inside the PCV within an accessible area. IRID intends to gather required information to determine a policy for fuel debris retrieval. *Please visit and see an overview of Unit 3 PCV. *Please visit and see videos of the robot regarding investigation inside the PCV in Unit 3.